In LHT and LFC, we are dedicated to discover our student’s potential in Science and hence provide various gifted education programs/activities to help them to build up skills and interests in Science. Taking the advantage of thorough-train policy, we can develop a consistent gifted education scheme for our students. 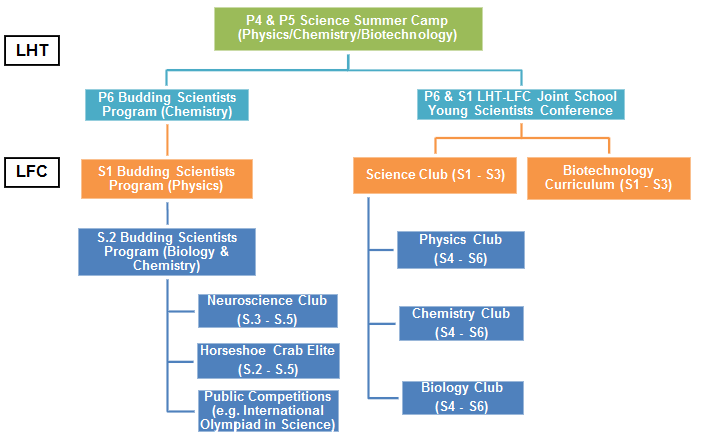 Students as young as P.4 are invited to participate in the ‘Science Summer Camp’ which continues with the pull-out gifted education courses ‘Budding Scientists’ in P.6 and S.1. Students can also be members in various clubs to continue their exploration in Science.